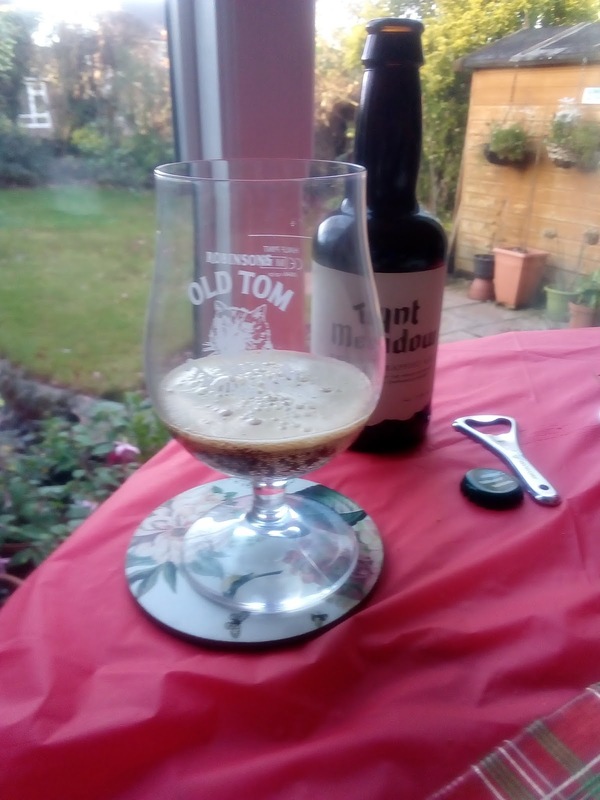 To celebrate the New Year yesterday, I opened a bottle of Tynt Meadow, a strong ale brewed since last summer by monks at Mount St. Bernard Abbey, a Trappist monastery near Coalville, Leicestershire, and named after the field in which the original monks lived in a small house after they relocated from post-revolutionary France in the early nineteenth century. The monks have been helped by Trappist breweries in Belgium to develop their beer (although the monastery brewed in the nineteenth century, that recipe had been lost), and they also made a trip to Robinson's Brewery in Stockport to pick up some brewing tips. The resulting beer is quite similar to a Belgian Trappist ale: bottle-conditioned, mid-brown, with a fruity, almost date-like, flavour, and, at 7.4% abv, a warming alcoholic finish. I thought it appropriate to pour the beer into a Robinson's Old Tom glass given the assistance the monks received from them. It also reminded of an incident when I worked at Stockport social security office: a man in religious garb walked into reception, explained that he had run out of money while doing missionary work in the town, and asked to borrow some to get back to his monastery in the Midlands. The supervisor recalled a rule that you couldn't give loans to monks - which I think goes back to the dissolution of the monasteries by Henry VIII in the English Reformation, when displaced monks began roaming the countryside, subsisting on parish relief - but a phone call to the monastery revealed that he was a novice who had yet to take his final vows, so we gave him his train fare, which was promptly repaid by the religious order on his return to them. Visit Coalville and wonder that anyone there remains sober enough to brew anything ! (Great boozing town, like Levy before the craft invasion).